Growing strawberries is not hard, but it can be a complicated business, requiring you to rework or renovate the planting bed yearly and constant runner vigilance. Or you can take a more lax approach. It’s not as easy as plopping a plant in the ground and hoping for the best but follow these tips, and you should be enjoying juicy fruits within months. As with any perennial crop, starting with a weed-free site will save you a lot of time and effort down the line. Perennial vegetables will be growing in the same spot for many years, and you only get one chance to start them off right. Once the weeds are gone, spread a 2 - 3-inch layer of compost on the bed. You can work it into the top layer of soil, but it’s not necessary. Some of the compost will get worked in when you plant, and some will get moved by the earthworms. Strawberries are shallow rooted and need their nutrients near the surface. There are 4 basic types of strawberries. June bearing, day neutral, everbearing and the tiny, but delicious, alpine strawberries. If you want to preserve strawberries, June bearing produces the largest crop at one time. If you want to enjoy your strawberries for a longer stretch than just June, choose day-neutral or everbearing. Day-neutral berries produce a small crop throughout the season. Everbearing aren’t everbearing; they produce 2 - 3 harvests per season, which are a little smaller in yield than what you would get from June bearing strawberries. Ideally, plant some of both June bearing and day neutral, and you’ll have the best of both worlds. 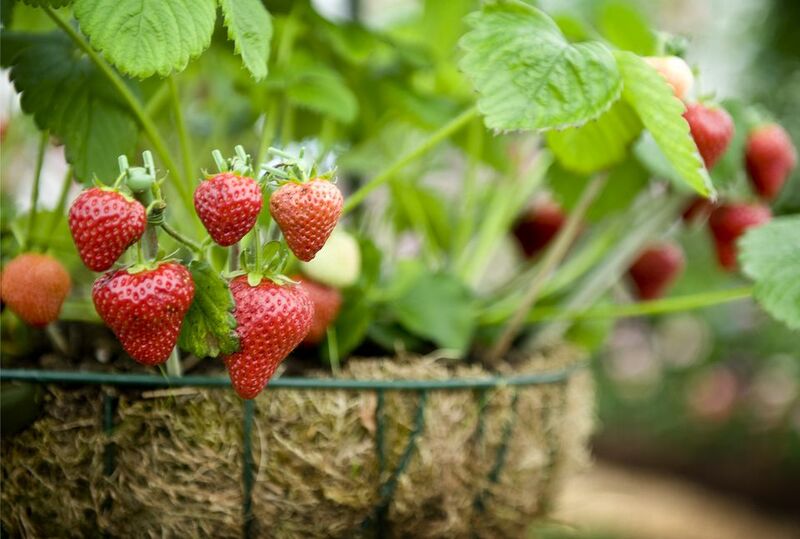 Strawberries are susceptible to a handful of fungal diseases, including verticillium wilt, botrytis (fruit rot) and red stele (root rot): Ask your local cooperative extension or a good nursery which, if any, are prevalent in your area and choose resistant strawberry varieties. It’s not a guarantee your plants won't be affected, but it will give your strawberry bed a better chance than without the resistance. If you do learn that your area is prone to a particular disease, make sure you rotate where you plant your strawberries, when you are starting a new bed. Avoid re-planting in the same spot, or the spores will build up in the soil. If verticillium wilt is a problem, don’t plant your strawberries where tomatoes, potatoes, peppers or eggplants have been growing, since these plants are also troubled by the same disease. Each plant should yield somewhere from 1 cup to 1 pint per season. Keep in mind that June bearers will produce this during 1 month and the other types will spread it out over the growing season. Most strawberry plants are sold as crowns; a mop of roots attached to a central growing tip. You can find potted strawberry plants, but they’ll be much more expensive than crowns, and you won’t gain any time by planting them. It’s essential that the crown is planted slightly above the soil line. For each plant, dig a hole 2 - 3 inches deep and wide enough to allow the roots to be fanned out in a circle. Then mound the soil in the center of the hole so that the crown is sitting just above the soil level. Fill the hole and then water it well. The soil tends to sink as it settles, so check that the crown is still above the soil surface level. If not, make adjustments and plant the rest of the plants a bit higher. Mulching is a big advantage when growing strawberries and straw is the obvious choice. A thick layer of soft mulch does more than inhibit weeds and conserve water. It also keeps the roots cool, which strawberries like, and it keeps the fruits off the ground where they can get into all kinds of trouble with insects and pathogens. If you don’t like the look of straw, consider grass clippings, shredded leaves or pine needles. Unless you are growing your strawberry plants as annuals, you will have to exercise some patience and delay harvesting for up to a year. To give the plants time to become established, you’ll need to remove all the flowers that set, for 4 - 6 weeks. Flowers and fruit take a lot of energy from the plants and removing them will put that energy and all the plant's resources into building a strong root system, healthy plants and lots of runners. Day-neutral and everbearing types will keep flowering, and after that 4 - 6 week period, you can let them set fruit. Unfortunately, June bearing plants will be done setting flowers, and you will have to wait until next year. We are not the only animals to love strawberries. There are many pests to be aware off, and 2 of the biggest are snails and slugs. Your straw mulch should help. They don’t really like crawling through it. Even so, watch for signs of their nibbling and take action quickly. It’s hard to believe something could be more of a pest than snails and slugs, but birds might top them. They can clean out a bed in short order. The best way to avoid this is to put some cover over the whole bed. You can use bird netting or row covers. Just make sure you don’t put it down while the plants are in flower or they won’t be pollinated. Wait until you see the fruits starting to form. Strawberries need about 1 inch of water each week. The 2 most important times for Keeping them regularly watered are at planting and when the fruits are filling out. At planting time, the roots haven’t yet developed many tiny, fibrous, side roots that take in water and nutrients and they can become stressed if left to dry out for any amount of time. And since the strawberry fruits are plump with water, they will need a steady supply, the whole time the fruits are forming. However, don’t let your strawberries sit in wet soil or they will develop root rot and quickly decline. These tips will become second nature to you, as you become an old hand at planting strawberries. But if you want an even easier approach, you might prefer planting them in containers and growing them as annuals. You probably won’t get as many berries, but they’ll be close at hand.